As the midnight train bound for St. Petersburg rumbled through the pitch-black Moldovan countryside, I tried valiantly to remain asleep, but my attempts were futile. The cabin was cozier than expected. We had plenty of room to stretch out and we were given care packages filled with comfortable bedding. However, the atmosphere was sweltering hot and unfamiliar. Romanian-Moldovan and Russian filled the air, and even though the train was nowhere near capacity, the cacophony of noise made it hard to drift into a deep slumber. 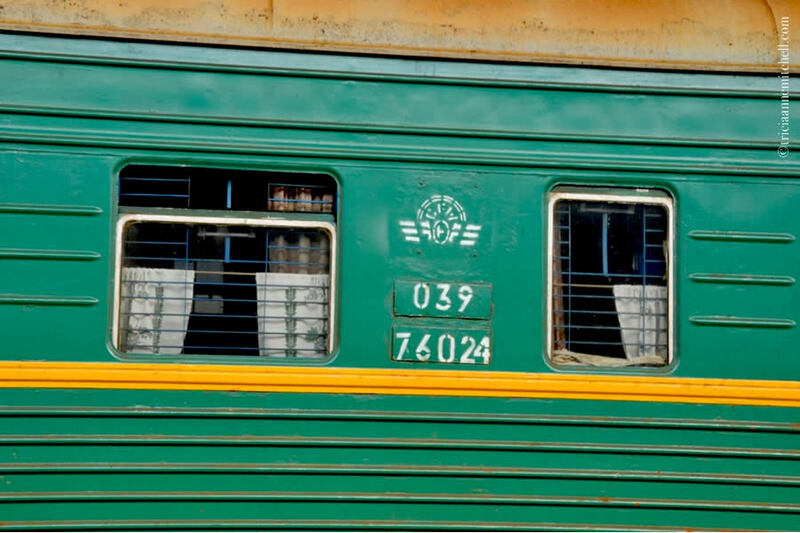 When the train again screeched to a halt, half-asleep, I heard the conductor usher a newly-arrived, Russian-speaking passenger toward our compartment. ‘Oh no,’ I realized. The bed I occupied was not the one assigned to me. For safety reasons, I’d opted for a lower bunk. I started to sit up, ready to move my belongings and myself up to my assigned, and somewhat scary perch. The lighthearted conductor, who reminded us of a Russian-speaking Joe Pesci chuckled, and said something about “Amerikansky.” He held a flashlight in his hand. Since we couldn’t find a common language in which to speak, he reverted to one line that he knew in French. “Je m’appelle Jean,” he exclaimed, while giggling and also uttering “Amerikansky – Las Vegas!” I don’t think the conductor’s name was really John, and we’re not from Las Vegas, but the unrelated snippets of his words made the exchange comical. More mumbling ensued, in Russian, and then the conductor and the new passenger emphatically said, “Okay” as the passenger opted to take another bed, so that I could stay where I was. I was grateful to this kind stranger for his thoughtfulness, but could only offer a simple thanks in Russian – спасибо (spasibo) – in return. A moment later, the thoughtful man returned from his bed around the corner. He held two green apples in his hands. With a wide grin on his face, he assertively plopped them into my hands. He was 2-for-2 in the random-act-of-kindness department. Now fully awake, but still lacking a common language in which to communicate, Shawn and I brainstormed. Then we had an idea. 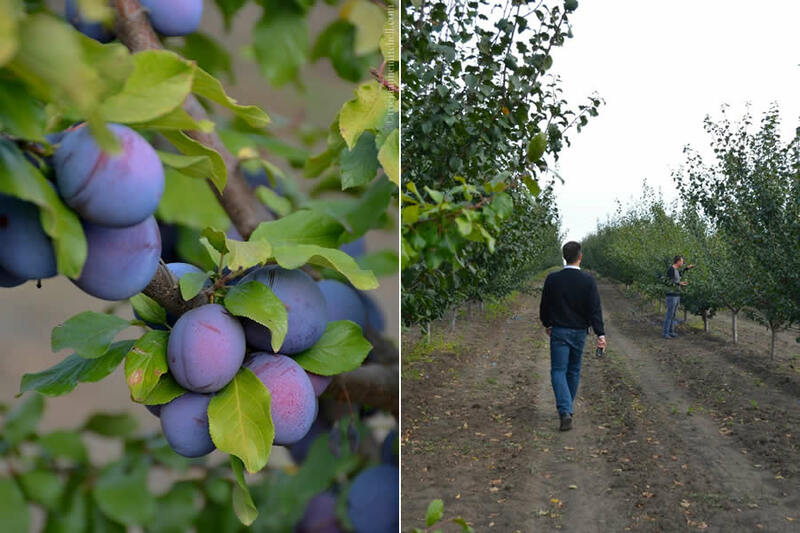 Two days before, in another act of citizen diplomacy, a Moldovan fruit grower and cold-storage manager named Ion Tulei had invited us to his expansive orchards near the town of Stefan Voda. For a few hours, we’d strolled the outdoor rows of apples, plums, and pears. We met some of the locals who were harvesting the fruit by hand, and toured the indoor cold-storage facility. 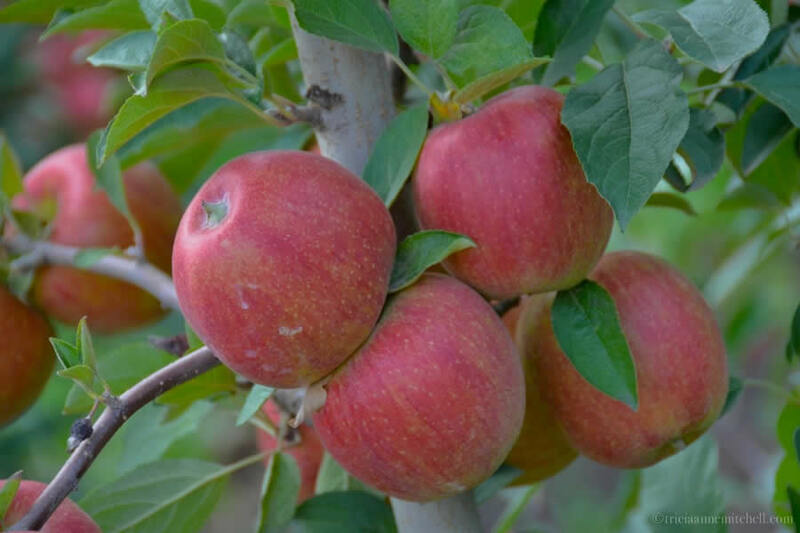 We felt like Adam and Eve as Ion encouraged us to pluck the fruit right off the trees. We would be utterly stuffed by the time we left the 80-hectare orchard. Among the tempting candidates of all shapes and hues, I saw one massive apple specimen hanging on a tree. Red, with a hint of green, it was probably the largest apple I’d ever seen. It looked to be the size of a grapefruit. It likely weighed 500 grams or more. Ion asked us if we wanted more apples to take with us. “Yes, please,” we said. “We’ll happily take one or two.” Instead, he appeared from around the corner carrying a cardboard crate full of apples – 80 or more. Since we were set to soon embark on another road trip, this time from Chisinau, Moldova to Lviv, Ukraine, we knew we’d only be able to enjoy 6 or so. Still, Ion was insistent. “Actually, would you like a second crate of fruit?” Ion asked. We laughed and graciously declined. 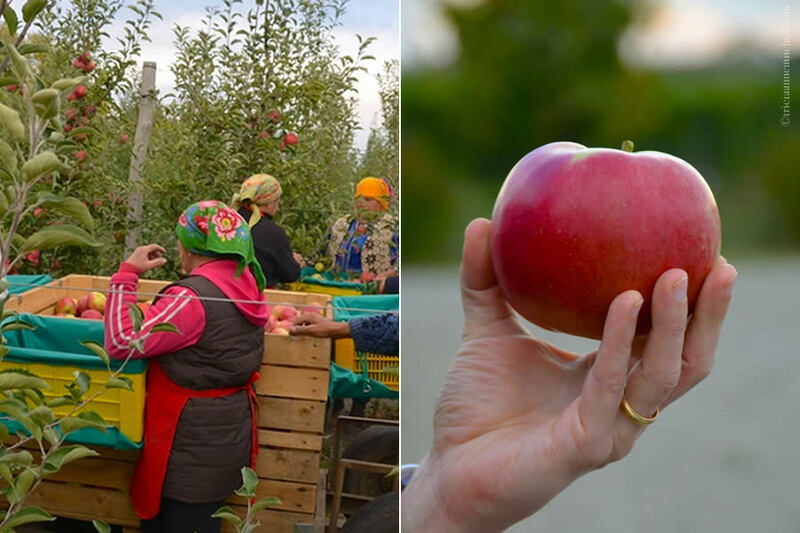 Reluctantly, as we were preparing to depart Moldova, we ended up leaving the bulk of the beautiful apples with our new friends at the nearby Et Cetera Winery. They assured us that they would share them with their family or take them to a community orphanage. In our luggage, we managed to fit 6 apples, including the elephant apple. When snacking on the apples as we traveled, I just couldn’t get myself to eat the mammoth one. I was treating it like a trophy. Or perhaps, I was awaiting the perfect picnicking moment at our next destination. On the night train however, we’d found the ideal recipient for the prized apple. Mischievously, I grabbed the gargantuan specimen, turned the corner of the train to where the thoughtful Russian-speaking passenger was sitting, smiled, and assertively dropped it down into his hands. He erupted in laughter. We didn’t exchange a word, but it was just as if we’d both reached the punchline of an elaborate joke. The random acts of kindness would prove to be contagious. In the morning, we reluctantly bid farewell to Moldova, a country in which we’d created so many wonderful memories. As we approached the Ukrainian border, Moldovan and Ukrainian guards came on board to scan our passports. The Moldovan looked Shawn squarely in the eye, and said, “thank you” as he shook his hand. It was a touching gesture. The spirit of citizen diplomacy would continue. 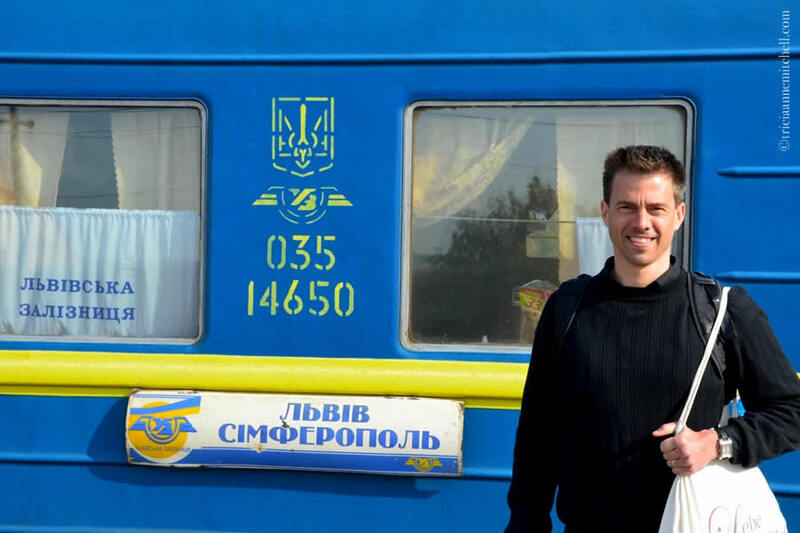 As our train rolled into Жмеринка (Zhmerynka), a city in central Ukraine, we disembarked, changing from a Moldovan green to a Ukrainian blue train car. We made the acquaintance of a new, friendly conductor. Seemingly on cue, Ukrainian passengers took on the role of citizen diplomats, enthusiastically waving at us through a neighboring train’s window so we could capture a photograph of them. As our westward train pulled away, we waved do svidaniya to our friendly apple diplomat bound for Russia. And we wondered what other apple ambassadors might emerge, thanks to the remaining Moldovan apples. 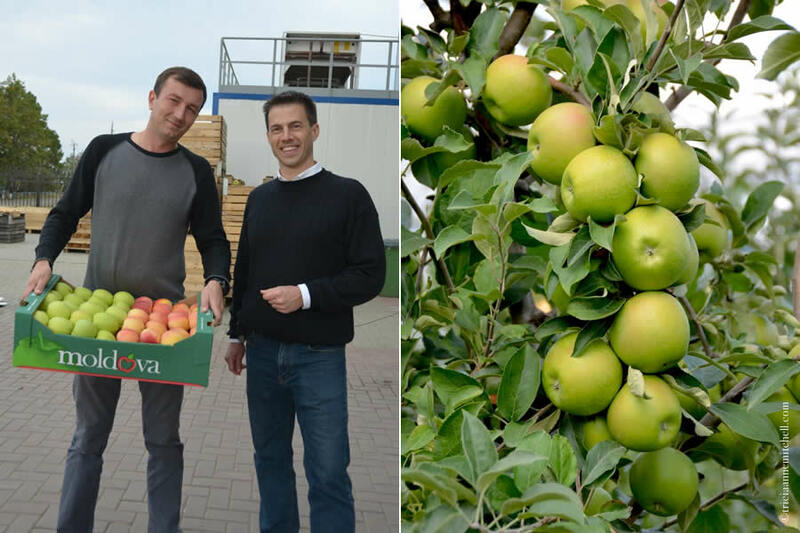 Ion Tulei, the Moldovan grower who started off a chain of goodwill when he took the time to show us his orchards and cold-storage facility, and then surprised us with this carton of apples. One of the largest apples from his orchard would become an integral part of the story as we travelled from Moldova to Ukraine by train a few days after meeting Ion. From apples of many varieties, to sweet plums and pears, we got to taste the fruit right from the trees. 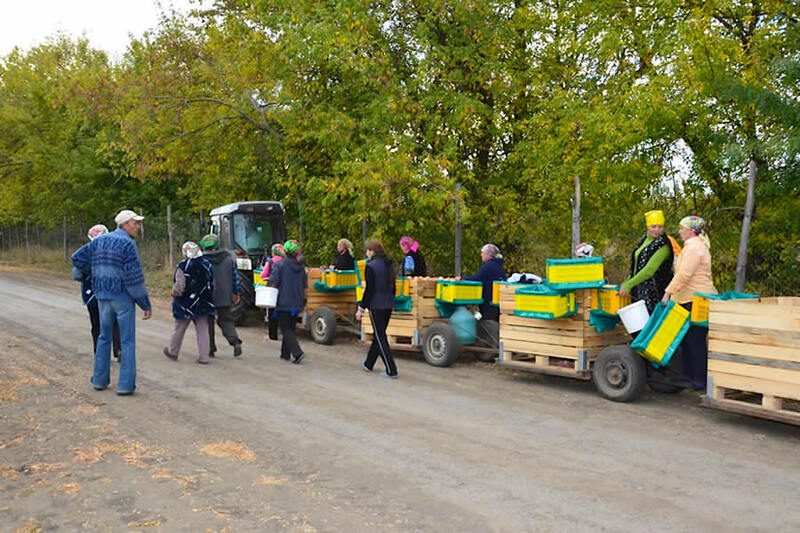 Moldovan harvesters pick heaping crates of apples, and then prepare to head home after a day’s work. On the right, the mammoth apple that was to embark on a long train journey. 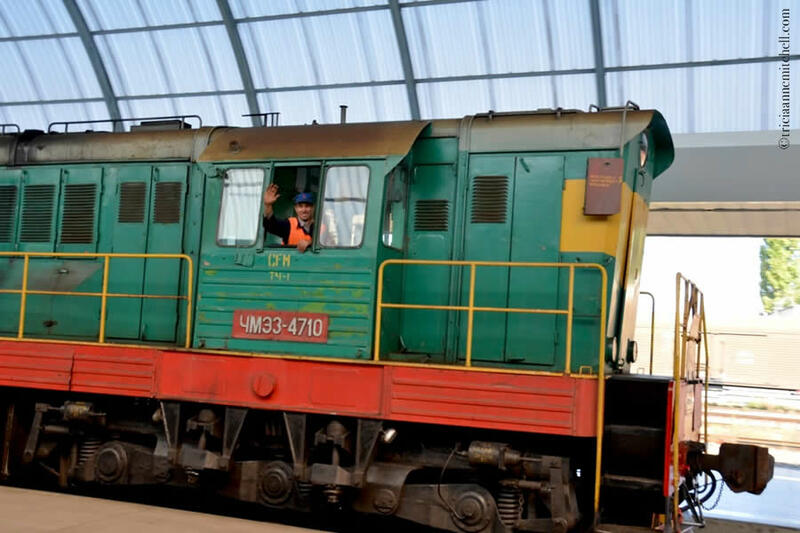 An engineer enthusiastically waves and toots the train’s horn as he arrives into the train station in Chisinau, Moldova. Though we weren’t set to board the overnight train for a few hours, we stopped by to get a lay of the land beforehand. The train station in Chisinau, Moldova. The exterior of our Moldovan train. Patriotic curtains bearing the colors of the Moldovan flag (red, yellow, and blue) graced the windows. An early-morning arrival at the Жмеринка (Zhmerynka) Train Station, a city in central Ukraine. Riding through the Ukrainian countryside. 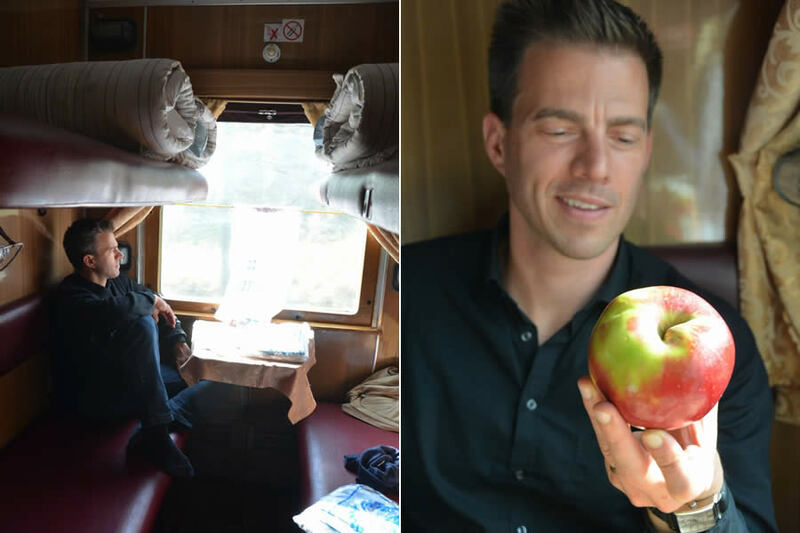 Relaxing in our train’s cabin with hot tea, and one of Ion’s magnificent Moldovan apples. Shawn, feeling rather sleepy, following our overnight train ride from Moldova to Ukraine. Passengers make us feel welcome as we prepare to board a Ukrainian train headed to the city of Lviv. We had our sights set on traveling from Moldova to the Ukrainian city of Lviv (Львів) by train, but trip-planning was not always straightforward. In the end, several Moldovans recommended that we travel from Moldova’s capital Chisinau, to the central Ukrainian city of Zhmerynka (Жмеринка). From there, we got on to a train bound for Lviv. The Chisinau-Zhmerynka leg took about 8 hours and the Zhmerynka-Lviv leg took about 6. To view bus routes and schedules throughout Moldova, visit the following transportation website (in Romanian-Moldovan). Need more inspiration? These links contain indexes of all my posts from Moldova and my posts from Ukraine. Photography & text © Tricia A. Mitchell. All Rights Reserved. A smile, a handshake, a barter (of aples) :-) this can create that sense of deep sharing, always so nice and sweet that it comes to the heart. I’m here with Cocoa on my knees, now he’s sleeping… before I showed to him your pictures and it was so sweet to see him resting his paws on the screen. He grows quickly… and at this rate, soon he’ll reach the tonnage of Hannibal (the largest of our cats). “Sometimes you don’t need to speak the same language.” Well said, dear Claudine. Shawn and I are touched by your warm message. Is it already possible that Prince Cocoa has been living with you for one month? We shall be in touch soon, with a longer email, but in the meantime, send you, Cocoa, Sara Luna, and your entire human and feline family the heartiest of hugs. Thank you for brightening our day! Thank you for sharing this heartwarming tale. With all of the frightening and sad world events in the news of late, a story like this reminds me that there is a light at the end of the tunnel. Carolyn, I’m glad you found the story uplifting. From Bali to Tunisia, Malta to India, we’ve met so many kind-hearted, generous people around the world. I think travel pulls us out of our comfort zones and allows these types of interactions to develop more easily, but I know they’re plentiful ‘back home’ too. Thanks for reading and sharing your thoughts. I’m happy our paths have crossed. Ha, ha, Bespoke Traveler, we were pondering that same point – what did they think of us? :) Travel is one of the finest ice-breakers! A really lovely post, Tricia. I love the story of the “elephant” apple. :) Happy travels. Hi Sylvia, I’m happy to hear that you enjoyed the tale about the apples that broke the ice for us all. :) So where in the world are you now – South Africa, or the US? With winter underway, Florida sounds like an especially nice place to be. Congratulations on your big news! With that being said, I’d also love to get back to South Africa. I was in Johannesburg and Pilanesberg National Park many years ago, but of course, am curious about Cape Town as well as South African wine country. It’s a pity to hear you say that Sylvia (because I can’t help but think of all the nice people I met there). With family nearby, it sounds as though you’ll be quite happy in FL, though. In what part of South Africa did you previously live? We emigrated from England to Johannesburg in 1970, and when we retired, moved down to the coast, near Durban. What wonderful encounters, so full of goodwill on all sides. Annette, famous sites and natural wonders are great, but it is certainly moments like these that help define a place. Wow! Look at that beautiful fruit! And what a great story of beautiful people everywhere. Marilyn, ah, we wished we could’ve taken more of those gorgeous apples along with us, but are pleased they ended up in deserving hands! I’m happy to hear that you liked this tale about the kindness of strangers. :) Hope you’re enjoying the holiday season, and thank you for reading. That is such a great story Tricia ~ travel into foreign lands, lacking the language skills can be a bit daunting, but all it takes is one of those great ‘apple experiences’ that forever changes an attitude. Really a great experience that must have been plopping that big apple into those hands… Great photos too! That is a great saying ~ a lot of truth to it. Cheers! I love trains. In Chile they have almost desapear, only one is still here but alway menacing with non existence. Thankyou guys for such a lovely view of those places. For some reason the countries that used to be part of the URSS give a kind of sad and scary sense of abandonement. I’m not sure why, but your post made me think of this and wonder. Son again thank you for such a lovely picture of this places and it’s people. Premalilah, I share your love of train travel too, and wish my home country (the United States) had more train service. Though much of the journey I wrote about here took place during the nighttime hours, we did traverse a part of Ukraine by day. It was such a treat glimpsing the autumn leaves and the villages as our train whizzed by. On a side note, we keep hearing wonderful things about Chile – particularly the dramatic landscapes and the wine. Perhaps 2015 might be the year that we make it there. In what part of the country do you live? Thank you for your thoughtful comment and for dropping by! Hi again Terri! Belated thanks for your holiday wishes. Shawn and I rang in the new year in snowy Germany, after digging out of 1 meter of snow, and we’re now visiting family in the Southwestern US. We’re loving soaking up all the Nevada sunshine. We’ll be hopping back over the Atlantic in about a month. Great post, I really got a perfect impression of what you saw and experienced. Thank you. Cecilia, glad you enjoyed the tale of our encounters in Moldova and Ukraine; thanks for dropping by!